The idea of a “Hot Rod Lincoln” was once so popular that it was even immortalized in song. Today’s Nice Price or Crack Pipe MK VIII is pretty hot, but let’s still see if its price tag can also bring the heat. Last Friday we waged a war on those mad souls who call certain four-doors “coupes.” Ha! What’s next, calling a steel-roofed car a convertible just because you’ve installed a sky blue headliner? Seriously though, whatever happened to the widely accepted and extremely descriptive “Sport Sedan” designation? The objet d’art of that war was a 2016 BMW 650i Gran Coupe (with yes, four-doors) that was fire sale priced at $49,750. That’s a good ten grand less that most at its level of kit and mileage, but that price came with a cost, that being a salvage title with a frustratingly undisclosed origin. The unknown can be a very scary thing, especially when it’s connected to a uber complicated Bimmer, and that 650i ended up with a 61-percent Crack Pipe loss as a result. Coupe D’etat indeed. Today we have another coupe, albeit an older one and with a good bit less complication across the board. Oh yeah, it also comes with a claimed 735 horsepower. Lincoln’s Mark VIII was the last edition of the long-running luxo-coupe line from Ford’s we don’t know what we wanna be brand. In LSC trim it was the marque’s most aggressive and engaging ride in… oh I don’t know, forever? It also came at a point in time when the era of the big personal coupes, like that of the dinosaurs before them, was coming to a close. Some people however still love a good two-door, and some of those odd bodkins’ also think that too much is never enough. Into that narrow Venn Diagram intersection you could slot the builder of today’s 1998 Lincoln Mark VIII as it’s a coupe, and with both a monster motor and tastefully innocuous mods. Could this be the nicest and most horsepower-iest Mark VIII you are ever going to find? I’d have to say, the answer to that question is unequivocally yes. Let’s start with that killer mill waiting pensively behind that long, slippery nose. The seller says it’s a 2003 SVT Cobra (Terminator) DOHC V8 with just 65K under its belt. To that has been added a Kenne Bell Roots style supercharger and an air to water heat exchanger. That latter comes with an LED illuminated radiator because EFF-YOU-ENN. The fuel system has been embiggened to feed the now pressurized 4.6-litre, and the whole thing has been dressed up to make every hood opening an awe inspiring event. Behind every great engine is a good transmission, and here that’s a Lentech street 4R70W. That’s running off of a high-stall torque convertor and is backed up by an aluminum driveshaft. 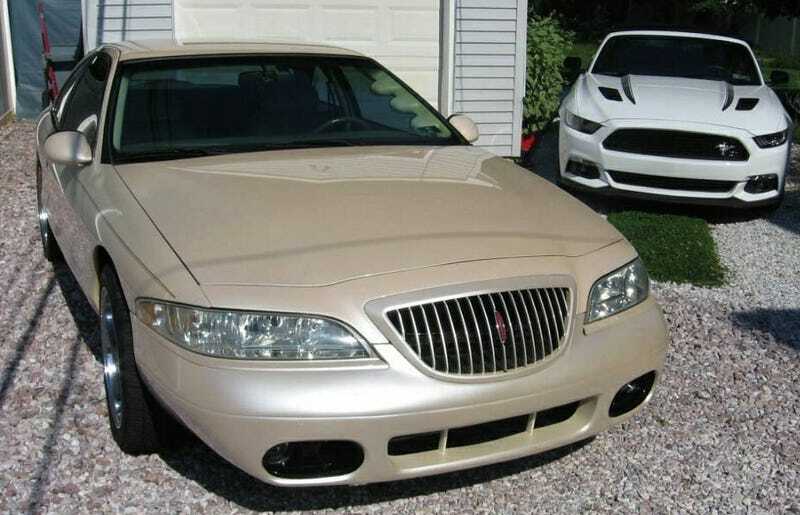 A nice thing about the Mark VIII is that there’s a lot of Ford Performance parts that can be added to it and here that extends to Cobra discs front and rear and, maybe most amazingly, a Mustang Cobra lower-front bumper adapted for the Lincoln. That, along with the cleaned up grille and subtle de-chroming, makes this Mark look pretty fresh. The finicky air suspension is said to have also seen a thorough re-do and everything seems to have been well thought out. The interior has seen less change, but I would like to point out the A-pillar gauge pack. This is perhaps the only Lincoln to ever get such an accoutrement and it’s awesome. The rest is pure ‘90s luxo-boat, which, while kind of plasticky seems to have aged well. It even has its ‘90s cassette stereo in there. There’s more mods than you can shake a stick at here, and aside from the chrome lettering under the hood denoting the MADMARKS builders and 735 horsepower, they’re all pretty tasteful. This isn’t just some car nut with money’s masturbatory fantasy, I think as it sits it’s a car that has a lot of appeal. The question is, does it has $25,000 worth? The seller seems to be a dude at retirement age as he sure seems to know a lot about 401Ks and their use in fulfilling automotive fantasies. He seems to be looking for a like-minded soul, not for some creepy hookup but to be the next in line to enjoy the bountiful fruits of a well-planned retirement. What do you think, is this crazy horsepower Mark VIII worth that $25K in old-age money as it sits? Or, is this a sleeper that’s priced to never wake up? Philadelphia, PA Craigslist, or go here if the ad disappears. H/T to AFSCTSV for the hookup! At $49,750, Does This 2016 BMW 650i Gran Coupe Have You Asking What’s The Catch? A 2001 Lincoln LS for $3,000? It’s Got A Stick!